Before I started my current employer down the road to AngularJS I decided to do a small (but complete) project using it just to see what it felt like. I had a colleague from my previous job who needed a website at precisely this point in time when I needed a project to do. It was small, self-contained, downloaded all of the data it needed at the time it initialized (so I wouldn’t have to start using AJAX with AngularJS and come up with a service layer when he didn’t already have one in place). In other words, it was almost like it had been designed for what I needed to learn. The interface as the user first sees it. His original design called for buttons the user clicked to get a quote generated and to clear out a quote when the user wanted to get a new one. I wanted to see if I could use AngularJS to generate two versions of the same website using the same controller; one would have the buttons of the original design, the other would simply update all of the prices in real-time as the user selected colors, sizes, etc. When I was done I had a couple of functions and flags the “quote button” version of the site used that the real-time update version of the page didn’t need but otherwise the same controller worked quite happily with two different versions of the UI (the original and my design). Needless to say, the real-time quote updates version of the site was much less clunky to use and is the only version of the source code I’ve made available on Github. My colleague (who also provided me with the web design) preferred it as well. 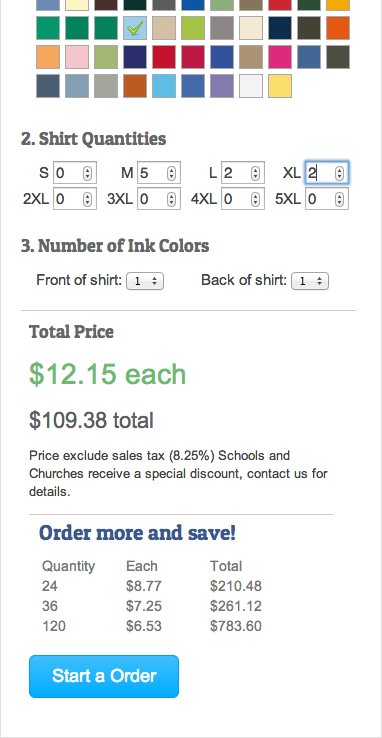 Prices and the quantity discounts update in real-time as the user changes colors, printing colors front and back, quantities, etc. All of the shirt data and pricing data were just dumped as JSON into a file and used as global variables by the controller I built. Now I know that I could put them into an AngularJS service and inject them into the controller. That would be cleaner, but you won’t see it that way in the current code. I need to do another view to demonstrate how the user could flip over to a catalog of shirts in order to pick a different type of short-sleeved shirt, long-sleeved shirt, crop-top, etc. and then that would change the route to pick a different shirt. The routing for a selected shirt is in place, but the picking page isn’t. The fellow I was working with said he could provide that, but I think my example would be better if I went ahead and put one in. I do a lot of calculations and sub-calculations to bfigure the price and to figure the price at different price-break levels for the display. That code should really be unit tested. I actually did something about this recently, read on for details. So I recently returned to the project with an eye to fixing a few things and the largest change I made was to use it to figure out how to do both unit tests and figure out how to know how much of my code was covered by the tests. The coverage report was, let’s just say highly motivating, when there were only a few tests in place so I spent a few hours writing a simple suite of tests to get me to 100% coverage. The sudo won’t be necessary on Windows systems but on Mac OS X and Linux you’ll want it because we’re trying to install Karma, our unit test runner, globally so you can use it from any of your projects. Once you’ve done this once, you shouldn’t have to do it for each project. 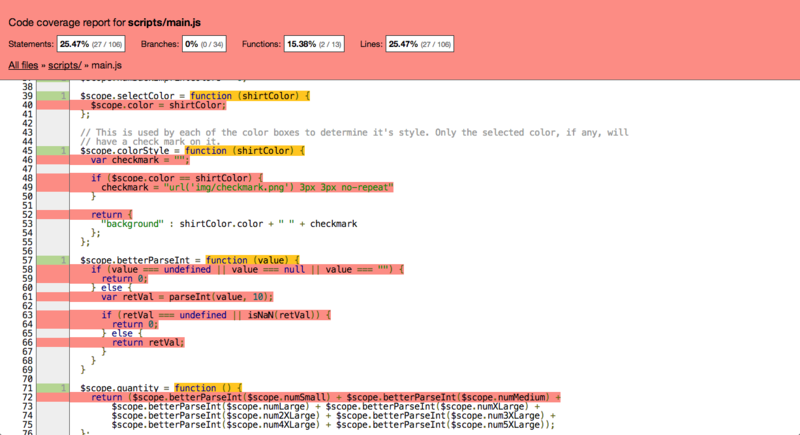 This gives us a Karma component which can check the percentage of our code which our tests reach. It’s uses the Istanbul project and it will show you at the line level exactly which lines are getting hit by your unit tests. The –save-dev adds it to the dev-dependencies part of your package.json file so npm knows it’s only a development dependency and not a runtime dependency. They’re different tools but both bower and npm recognize the –save-dev flag and use it the same way. In this case angular-mocks becomes a development dependency in your bower.json file. It will help us when we’re building our unit tests for AngularJS code. The installation parts are done, now it’s time to add unit testing to a particular project. 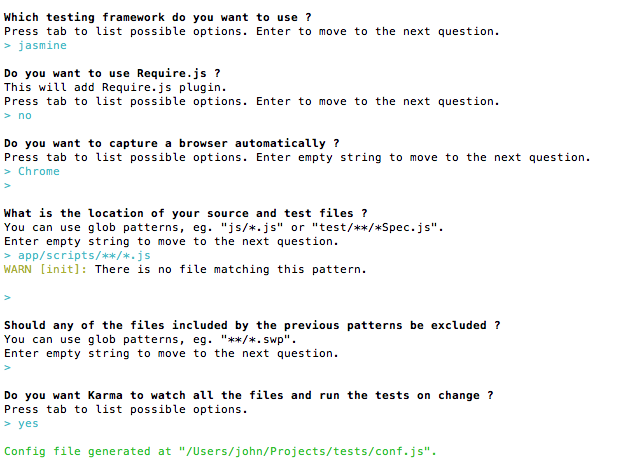 This will get Karma to ask you a series of questions and generate a configuration file. With a few tweaks to that file you’ll be ready to run unit tests and get code coverage information for your tests. If you actually open up the config file Karma generated at this point you’ll find it pretty easy to read. It has nice comments so you can tell where it wants you to put library files, the files you want to test, the browsers in which you want to test, etc. You’re going to make two edits to the file at this point to get some things we want in there. This should be a one-time thing again. There’s a files array part way down the page. Make sure you add the path to the angular-mocks.js in there. And you’ll need to add a preprocessors section like you see below so the code coverage tool knows exactly which source it’s checking for test coverage and add ‘coverage’ to the list of reporters to turn on the coverage checker. Note: If you use the latest angular-generator together with the latest Yeoman it seems like the generator now creates a Karma config file (karma.conf.js) and installs the angular-mocks so you can skip those two steps for your new project if you’re using Yeoman to generate it. Finally there’s the writing of the tests themselves and the checking your coverage to see where else you need to craft tests. To kick off this process, run “karma start” at the command line and Karma should now kick into gear, start up the browser or browsers you wanted your tests to run in, and start watching all of your source files for changes. This is super handy because you can save a change to a source file or a test file, Karma will notice that and rerun your tests so you get immediate feedback on whether everything is passing or not. When I had only one test completed, this is what the coverage report looked like. Look for it in a subdirectory under the coverage directory after you’ve run some tests through Karma. 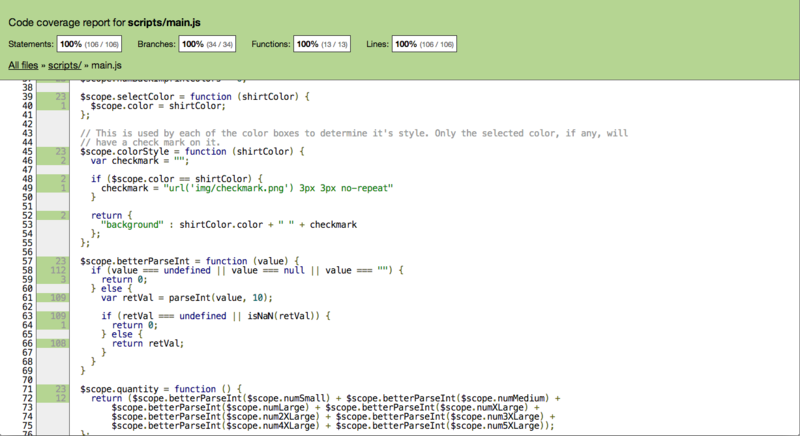 With tests written for all the code in main.js there’s lots of green and 100% coverage indicators at the top of the page. Good luck, I hope some of my code is helpful to you in your own projects, and feel free to ask questions about any of it. I’ve been wanting some specific pages of paper for the paper pad I use at work. I’ll plug the specifics features and brand I love below because I think it’s really cool, but let’s stick to the programming for the moment. Anyway, there are lots of websites out there that will let you download many different configurations of “graph paper” for you to print out on your own printer. That seemed like what I wanted but site after site that I went to had only a big (or small) tub of PDF files from which you could pick. Sometimes they printed out well, most often not, and they really didn’t have the setups I was interested in trying (something like Cornell Notes but with different things in different areas, like dots or a blank area sometimes instead of lines). 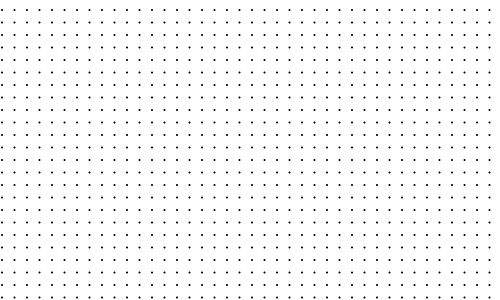 So I had the clever idea that I would put together a simple one page website where you could pick from a few simple blocked out versions of a page (for different sizes of paper like US letter and A4 or portrait vs. landscape layout) and then put any of several different patterns in each area. Then I would generate the page using SVG in the browser and you could print out the paper and even bookmark your creation so you could come back and print it as often as you like. Sheer genius! Except for one thing, even in 2013 when lots of browsers are claiming to have good SVG support, they kind of forgot to support printing and SVG… So you get results that look great in-browser with Chrome or Firefox and you can zoom in four or more times and still see sharp vector drawn shapes. Print out that same thing and you’ll just get a fuzzy mess, even if you choose PDF as the output target where logically the vector shapes should have just been sent straight into the PDF and zoom just as nicely as they did on screen. It looks a little aliased on-screen on Chrome but that didn’t bother me, I don’t have a Retina display on my Mac so I expected it to be a little rough at anything other than print resolution. 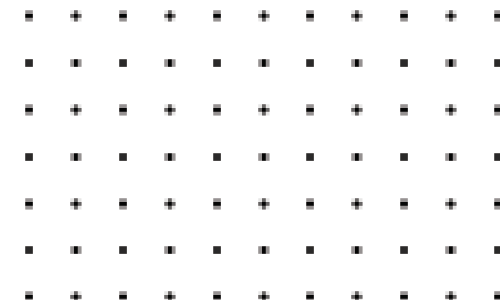 Here’s the same SVG dot paper zoomed in 400% on Chrome. Yup, I did it correctly. 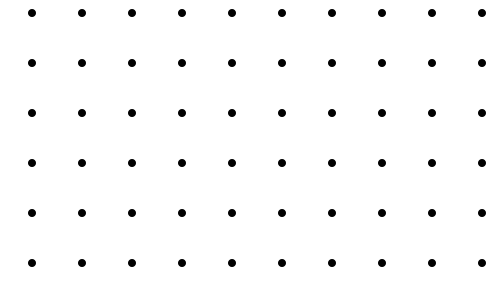 All those dots are little circles spaced out just like I wanted. Zoomed in everything looks good! Let’s print it! Wow! That’s exactly nothing like what I drew. Thanks Chrome, thanks Firefox! I didn’t have the heart to try it in IE, I figured it would just be straight up blasphemy. And it wouldn’t matter anyway, because even if IE worked perfectly, any solution that wouldn’t work in Chrome and Firefox would be next to useless because those two browsers represent more than half (and by some estimates right around 66%) of all browsers being used today. Oh, I did promise a plug for the nifty paper pad I use. If you’re in the United States then the Staples chain of office supply stores has a neat line of pads and paper called Arc. It’s almost identical to the Circa notebooks that Levenger carries except much less expensive. In both cases the spine of the notebooks have a set of small plastic disks onto which specially punched paper is pressed. Just the cross-section shape of the rings and the way the paper is punched is sufficient to keep the pages in place, but should you choose you can easily remove pages, add pages, or rearrange pages without the finickiness of ring binders. I love mine and I bought the special punch that Staples sells so I can use whatever paper I like in my notebook. As a result it’s a mix of blank pages, lined pages, pages for laying out iPhone apps, and even notes I printed out from Evernote. Thus my desire to generate all new forms of paper ideally suited to how I take notes and for noodling on new ideas. Despite my inability to make this work with SVG, I’m not giving up. I’ll just have to think for a while and return to the problem. Necessity is still the mother of invention and I still need pages I can’t get on any of the downloadable paper sites I’ve been to yet. This entry was posted in Uncategorized and tagged browsers, bugs, paper, PaperQuik, printing, projects, SVG on September 1, 2013 by John Munsch.